Why is it, that when it comes to the Humane Society of the United States it seems as if it is always about the money? Now, don't get me wrong, I know that fundraising is important. We all need money to help our cause. Rescues need money to save the lives of animals. Lobbying groups need money to lobby, get politicians elected, get bills pushed through. I don't mind organizations raising money. What bugs me is when they raise money for one thing, and then use it for another. And that's my (most current) beef with HSUS. They keep asking for money, but what animal-loving people give them money for, in good faith that animals will benefit from the money, and what they use the money for, never seem to exactly add up. And for that, I am growing tired of the Humane Society of the United States. 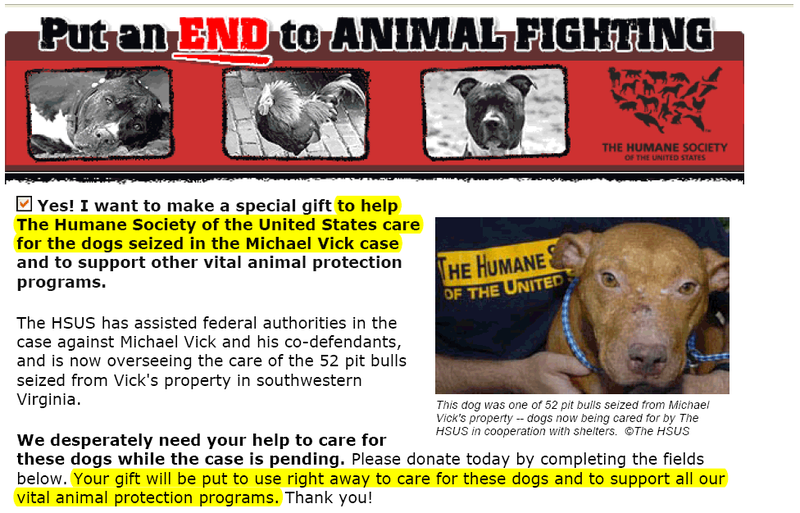 Just in the past few years, HSUS has sent an email requesting donations to "care for the dogs seized in the Michael Vick Case" -- even though HSUS was not actually caring for the dogs and was simultaneously lobbying for all of the dogs to be killed. A little over a year later, HSUS sent another email requesting that people donate just 66 cents a day to help dogs "just like Faye" in the new year -- using pictures of a dog named Fay (not Faye) that was rescued from a dog fighting bust orchestrated by the Humane Society of Missouri andFay, herself, was being cared for by a small rescue Mutts & Stuff in St. Louis. Of the $1.2 million raised by HSUS in their fundraising drive for 'dogs like Fay', the actual organizations caring for the actual dogs received only $5000 for their care. Meanwhile, HSUS seems up to their old tricks again. After the major earthquake in Haiti last month, HSUS was quick to get someone on the ground with a request to help the animals in need in Haiti. "But the conditions for animals are still deteriorating. In our short time here, I've seen cattle wandering through fields and stray dogs by the roads." Wow. Cows in fields? Stray dogs by roads? Sounds like Haiti on a good day...or rural America for that matter. HSUS's quest for funds raised the ire of many -- including Friends of Animals and their arch nemesis, Center for Consumer Freedom. I confess that I don't know a lot about the key players from the Center for Consumer Freedom...but I will say this. When they criticized HSUS about the use of money collected for helping animals after Hurricane Katrina, HSUS responded to the lawsuit by building a fancy new shelter for the the state of Louisiana. Now, amidst this criticism from the CCF, Wayne Pacelle has once again responded not by denying anyof the allogations....but, wait for it, by asking for money. The CCF may have questionable motives (or not), but they seem to always be right about HSUS. Now, again, my beef with HSUS isn't that they raise money. We all have to. But that they continue to raise money from unsuspecting donors and then using the money for something else. In 2008 (the most recent annual report available), HSUS spent $28 million of their $125 million budget on fundraising -- $28 million on political campaigns and $12 million on "strategic communications'. They also banked a significant amount of money (again) that they are using for other things: Like apparently buying tons of stock in restaurant chains like Steak and Shake and Jack in the Box -- with the idea that their ownership will influence purchasing decisions regarding chicken, eggs and pork. I'm not even going to say that I think this is a bad use of money necessarily (it would actually be a fun debate sometime) - but here's the deal, in all of the emails that go out asking for money, in all of the posts on Wayne Pacelle's blog, never once have I been solicited to donate money to buy shares in fast food restaurants. Not once. Seems I only find out about it from reading morning e-newsletter from Nation's Restaurant News (which I do get BTW, don't judge me). Seems like with that much money getting put to that use, it probably should have come up in communications from HSUS. Nope, it's not so much the fund-raising I mind....or even that they spend most of their money on more fundraising and lobbying...it's that I don't feel like they are at all honest with their donors on where the money is going . I think it's important that well-meaning people who in good faith want to give money to help save the dogs from Mike Vick's Kennels, aren't misled into giving money to an organization that is pushing for the dogs to be killed, or that when people give money to help "dogs like Fay", more than a fraction of a percent of the money raised will go to helping the actual dogs, and when people give money to help animals in Haiti, their money is not used to buy stock in fast food restaurants. It's disingenuous at best...fraudulent and illegal at worst. Re CCF - Anyone can say what they like about who they are, what they stand for, etc. But you can't fault their PETA and HSUS research. Brent...once again you have hit the proverbial nail right on the head. Very few "animal lovers" know the true agenda of HSUS and how little of their donations end up helping animals in need. At the Veterinary News Network, after the CCF posted the 2008 tax forms from HSUS, we directly asked an HSUS representative on Twitter (I believe she was their "new media" chief or something like that) to refute the evidence. She simply laughed at us! (Actually, she "LOL"ed at us in a tweet that simply attacked CCF without providing any useful information). We sent a professional email to her asking for HSUS' side of the story and we have yet to year from her (that was sent early last month). Yes Emily, I've been keeping up with BF and the ASPCA's Haiti stuff too. I'm sure there is a LOT of work to be done down there in general to give animals a higher level of care than they are currently getting -- that said, the same could be said for the majority of the people there. Thanks Jim for posting. I had vaguely remembered seeing that, but couldn't find it. It's pretty amazing to see an organization actually say "we have enough money for this cause -- if you want to donate for other ones great, but we're good here" vs just taking the money and using it for whatever. Actually, the AVMA went to Haiti with one of the earliest missions as a part of the coalition that HSUS decided to not participate in and, while they didn't find many animals in need of immediate care due to the quake, they did find a need for vaccination programs for both small and large animals. I believe they are working with Haiti officials on that as a long-term issue. OMG! Animals in NEED that are actually being CARED FOR! By REAL EXPERTS who know what they're doing! And not a single citizen to arrest for cruelty, abuse or neglect in sight...what's the world coming to these days? This post reminded me of a post from Anai Rhoads re: animal groups cashing in on Haiti (http://www.friendsofanimals.org/news/2010/january/hsus-ifaw-aspca-misl.html) and an elegant position on HSUS and local humane societies (http://www.localhumane.org/oldindex.php). Don't listen to anything Josh Gowans says. He ordered the deaths of many abused Pit Bulls in South Carolina, just like Ed Sayres did in NYC. If I was rating HSUS fund raising tactics I would be past fraudulent to criminal!